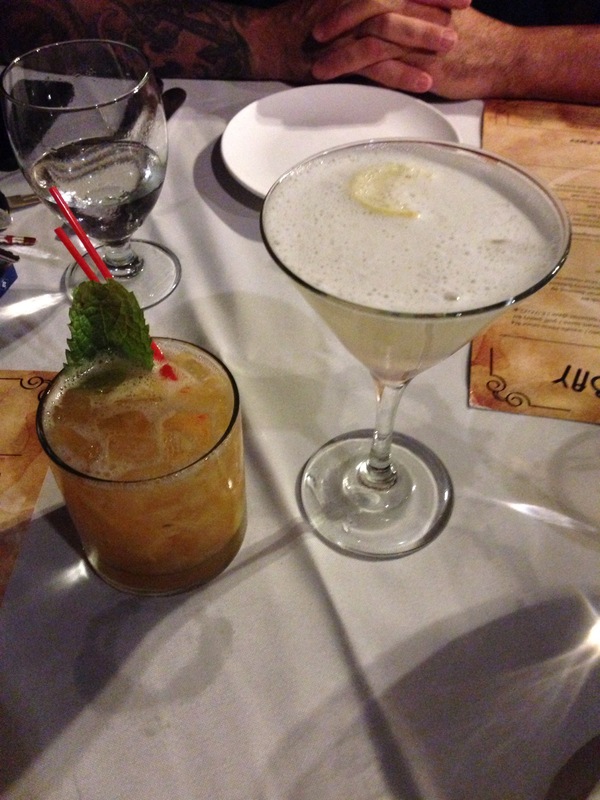 Gatsby’s on the Bay… And other things. 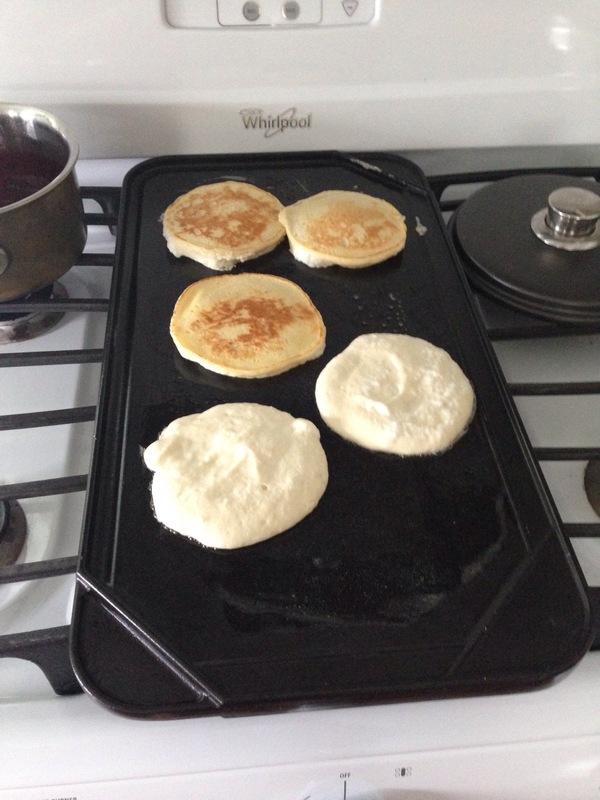 They were amazingly fluffy, and light and the ricotta flavor was subtle but perfect. 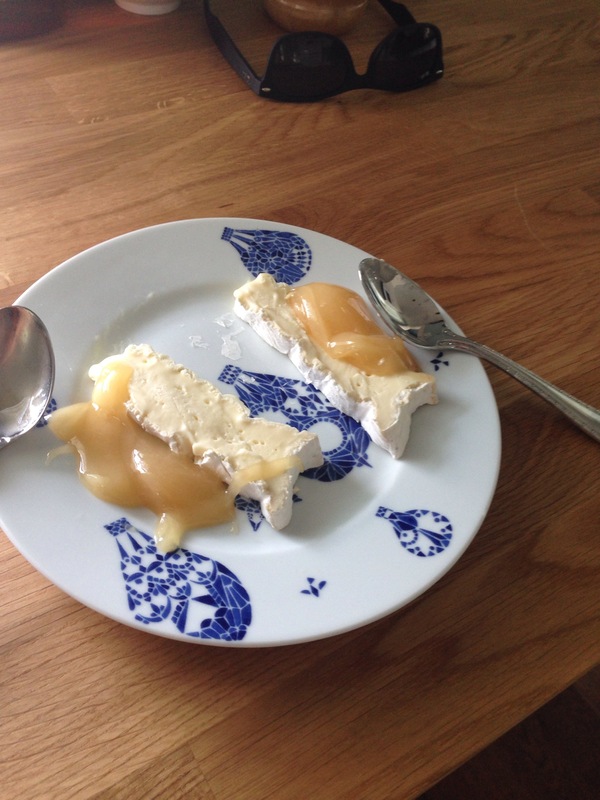 We had also gotten a fresh direct delivery of about one thousand plums from a local farm, so he decided to do a plum compote to go with the pancakes. That recipe was really just the plums and lots of brown sugar. When trying the pancakes with the compote, I found the plums’ flavor to be a little too strong. I preferred just a little bit of maple syrup. 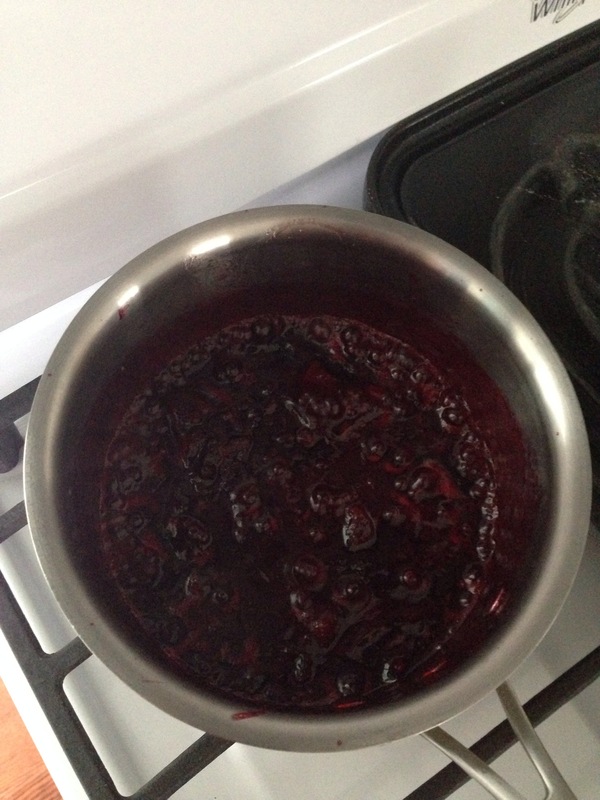 I do, however, think the plum compote is going to be the best topping ever for yogurt. 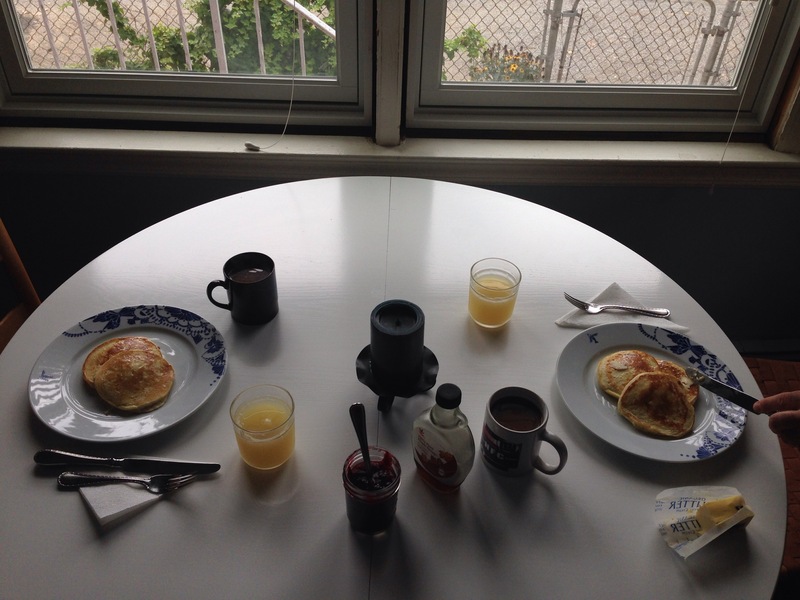 All in all, breakfast was the perfect start to a great day. 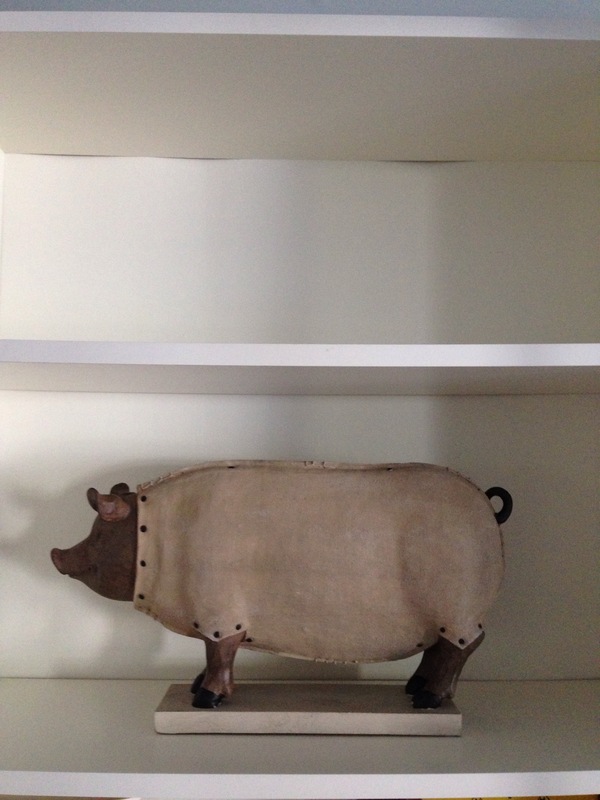 Next we went shopping at Homegoods for a few things: new garbage can for the kitchen, mason jars for pickling our garden’s peppers, a giant pig for decoration… Because why not. 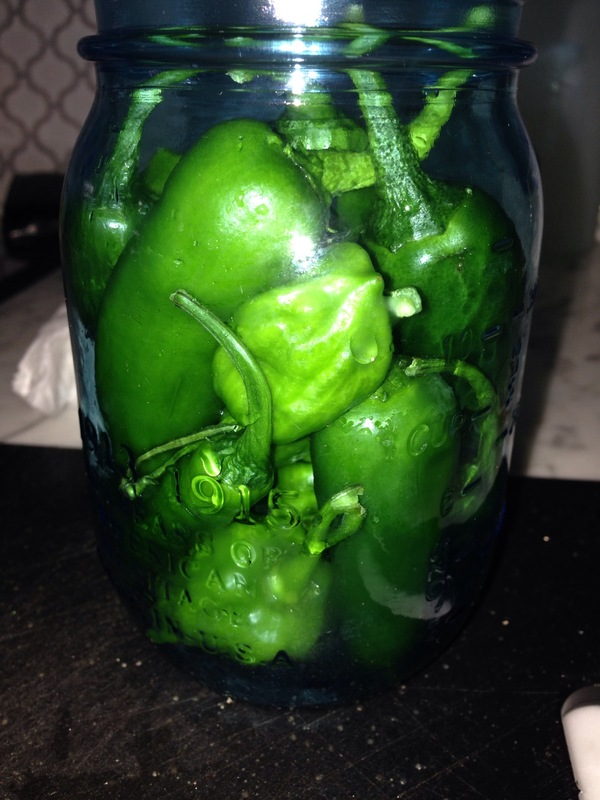 When we got home we got to pickling. We had collected a heaping bowlful of spicy peppers (Anaheim, poblano, jalapeño, Serrano) and didn’t know what to do with all of them. 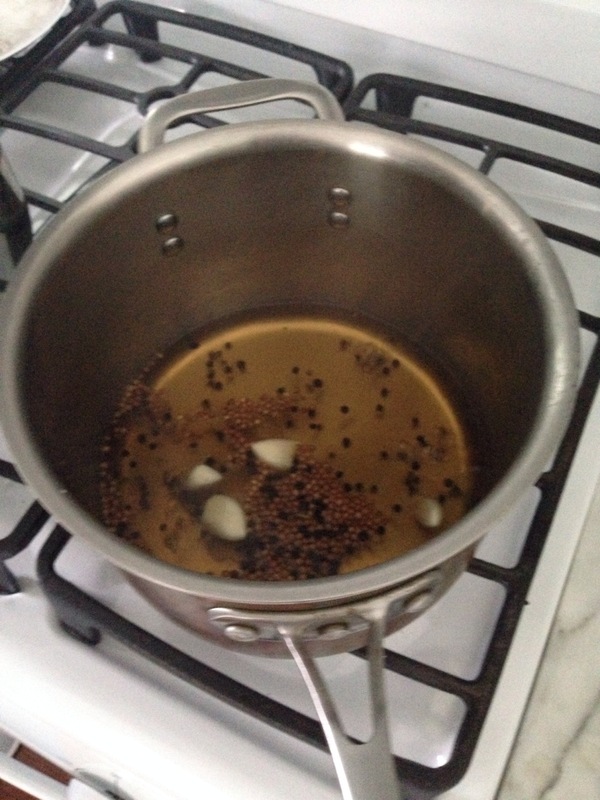 So we stabbed them all, boiled vinegar with garlic and peppercorns and filled three jars with them. After the pickling we spent our afternoon cleaning out some closets and cabinets and kind of re-organizing… One of my favorite hobbies, but kind of boring to write about. At 7:30 we set out for dinner at Gatsby’s on the Bay, a place in Staten Island I’ve heard amazing things about and I’ve been dying to try for a while now. 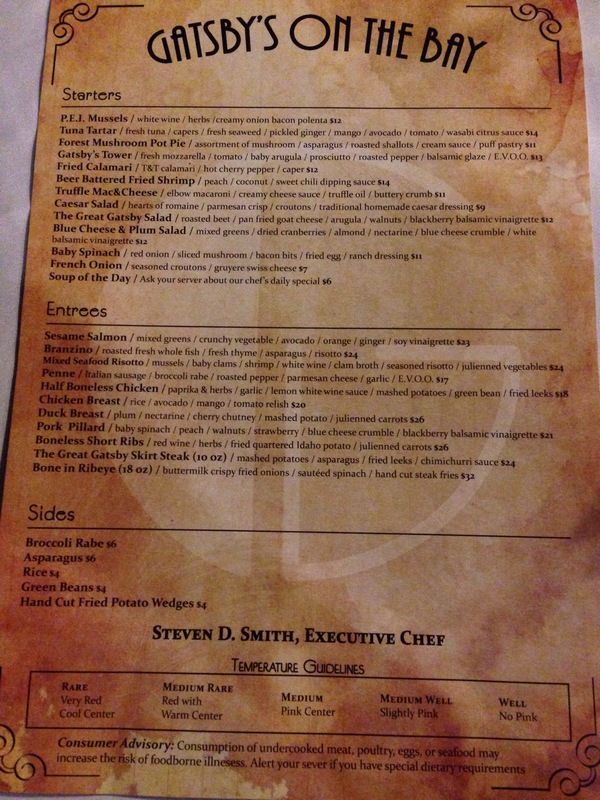 I was surprised at how empty it was… We definitely didn’t need a reservation at 8:00 on a Saturday night. We chose to sit outside, the weather was perfect. 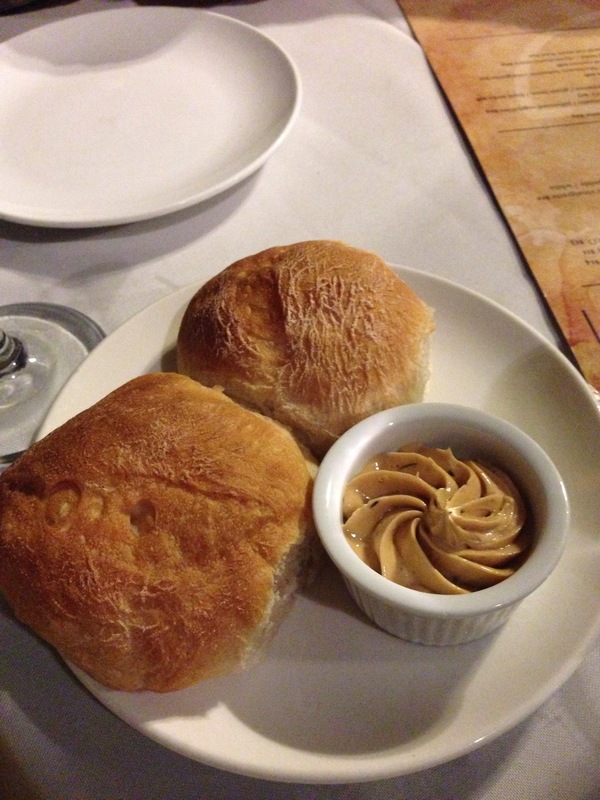 I was excited when the bread came out with a balsamic vinegar butter spread… Light and fluffy… Just something a little unusual and the flavor was great. I loved that the drink menu came in the form of a little recipe book, so I could see exactly how each drink was made. I went with the bourbon cobbler and Justin went with the smoky martini. 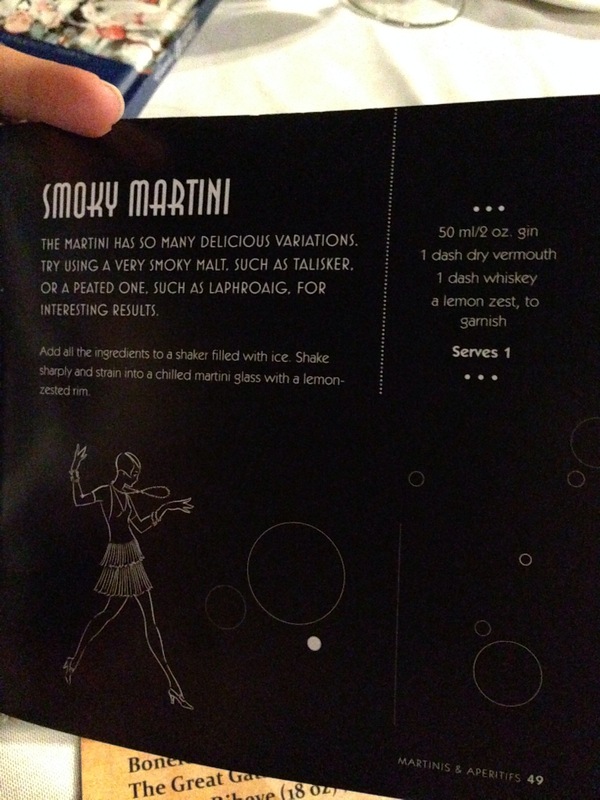 Justin’s martini was great… The smokiness was weird but good. 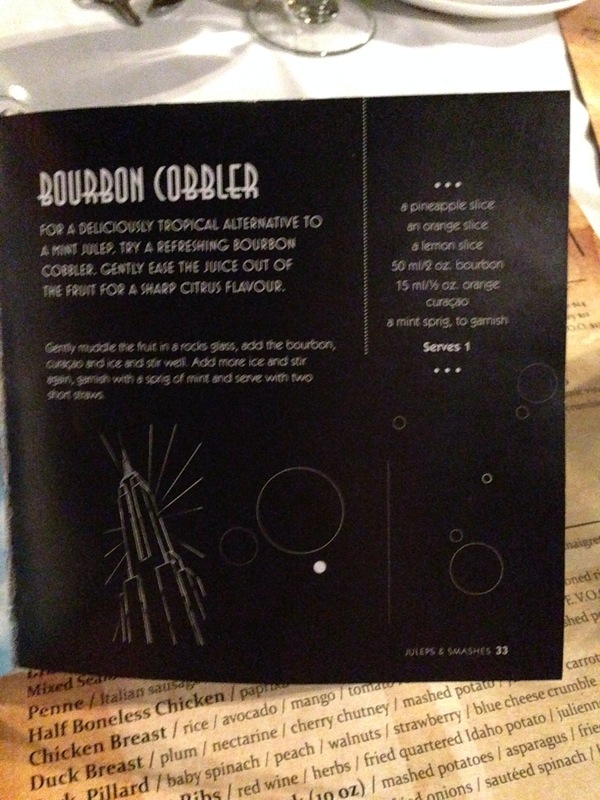 I loved the flavor of my bourbon cobbler, but it became a little bit annoying to drink. The glass was full of ice so it was hard to sip, and there was a ton of muddled fruit so it was impossible to drink through the stirrer straws. After ordering drinks we began to consider our food choices. We went with the Gatsby salad and the PEI mussels. 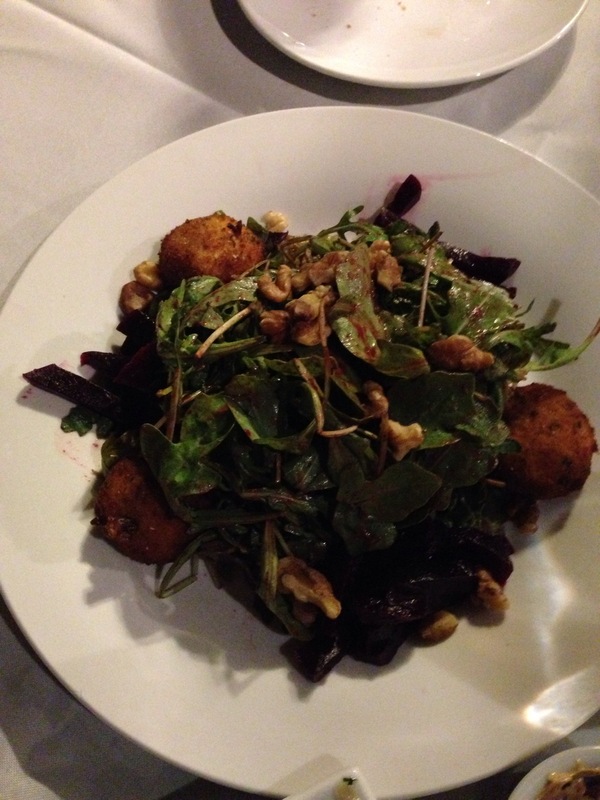 The salad was a solid “good”… The balsamic dressing and greens were very basic, with some walnuts and beets mixed in. The fried goat cheese balls were the standout in this dish – because who doesn’t love fried cheese. After our “healthy” salad, we moved on to the mussels. Justin was immediately pissed that he’d eaten all of his bread already, although I am certain they would have gladly given us more. 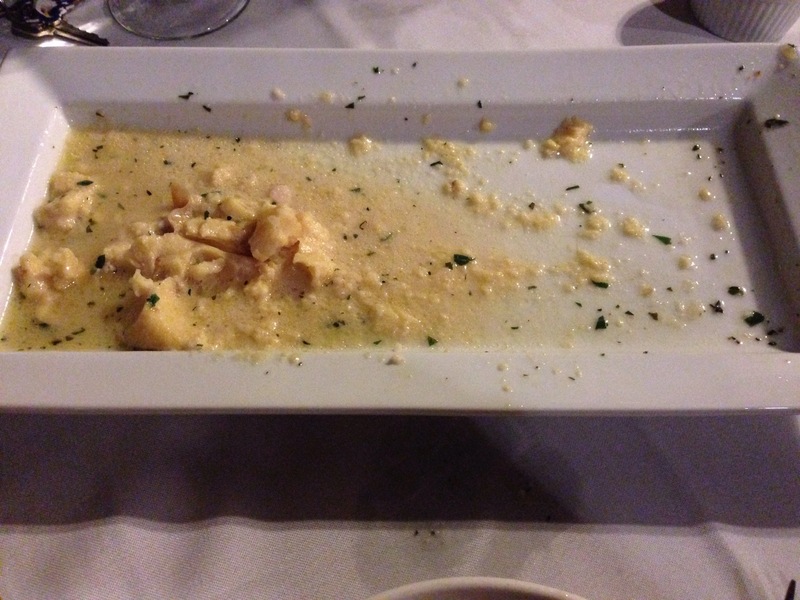 Once we dove into the dish, though, we quickly realized that the bacon (yes, bacon) polenta was magically absorbing the delicious buttery winey juice that we were so worried about missing out on. The mussels themselves were good – I don’t think you can really screw up mussels. But the polenta paired with them was seriously amazing. The grainy texture went perfectly with the smoothness of the actual mussels. 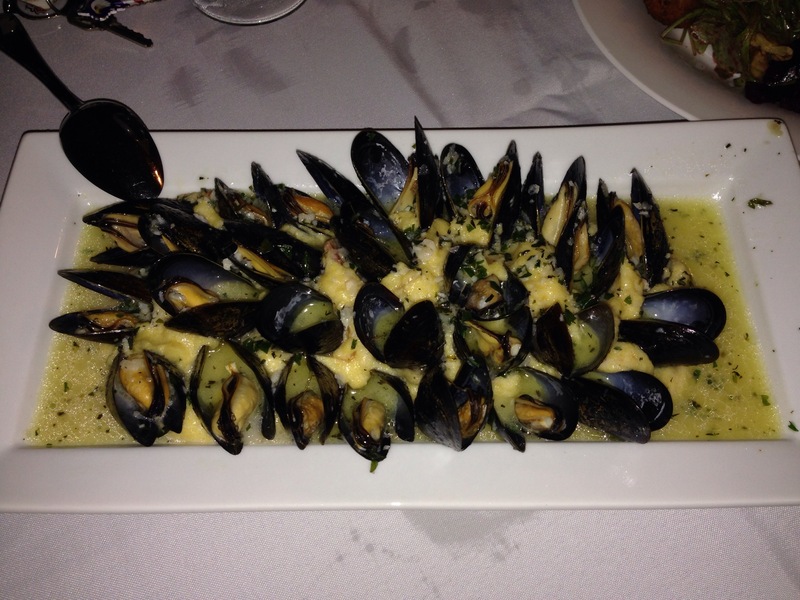 And when the mussels were gone, we found ourselves just scooping up the juicy polenta by itself. This was the single best part of our entire meal. 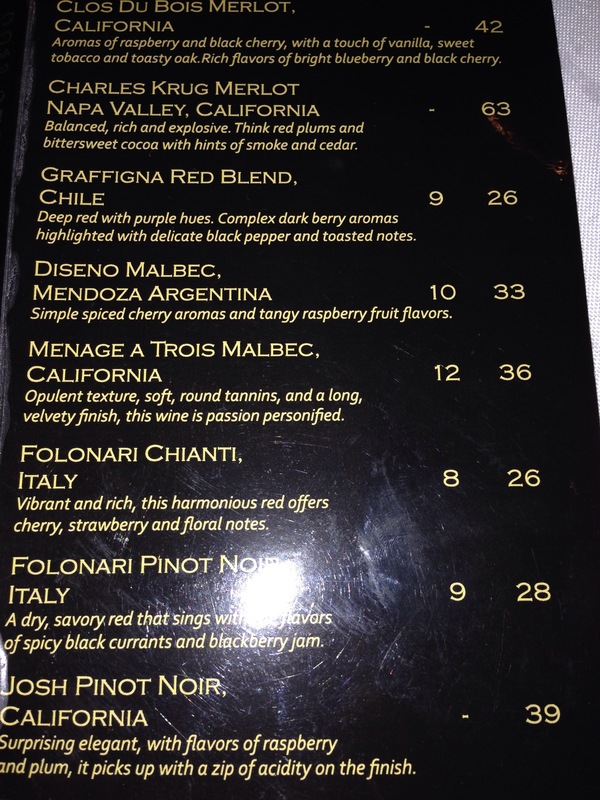 For our entrees, we switched to wine and went with the Ménage a trois Malbec ($12 a glass). I’ve said before I am no wine connoisseur. To me, wine is either good or really good. This wine was really good. The word “velvety” that they used to describe it on the menu was spot on… This is a wine I will actually look out for in stores now. 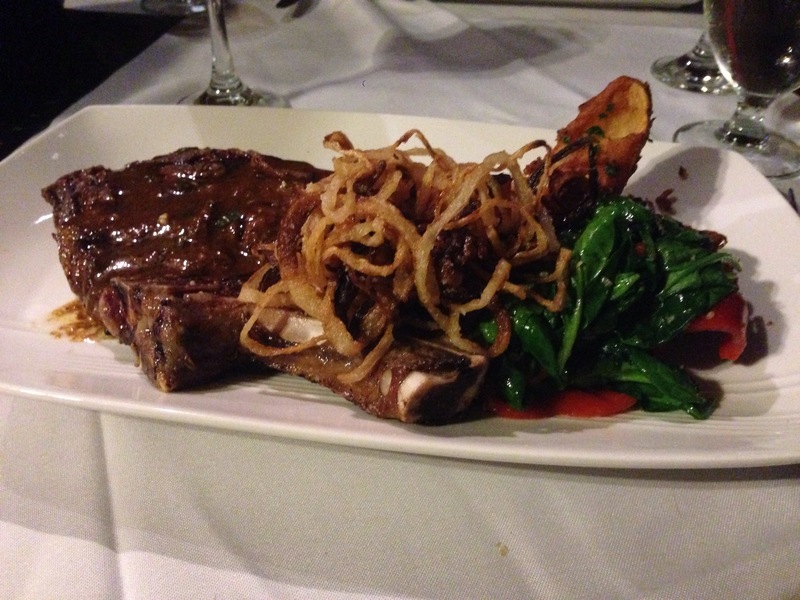 For my entree, I went with the boneless short ribs, and Justin went with the 18oz. bone in ribeye. Both were solid really good meals. 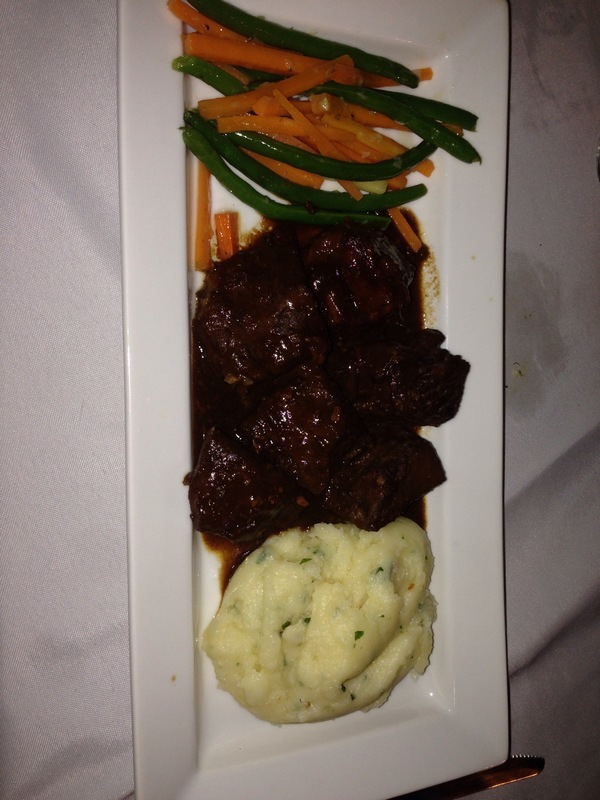 The short ribs’ sauce was rich and extremely flavorful… Like a whole bottle of wine reduced into a few spoonfuls of heaven. The meat itself was a little tougher than I expected, but the sauce made that extra chewing worthwhile. I loved that they easily accommodated my request to switch the quartered potato for mashed, which were very good. Justin’s steak was cooked perfectly. The crispy fried onions that came with it were just the right amount of salty. The steak fries were amazing, too. For dessert, it was a difficult decision. He got a double espresso and I a regular black coffee. We were torn between lots of great options like lava cake, fondue, and creme brûlée. 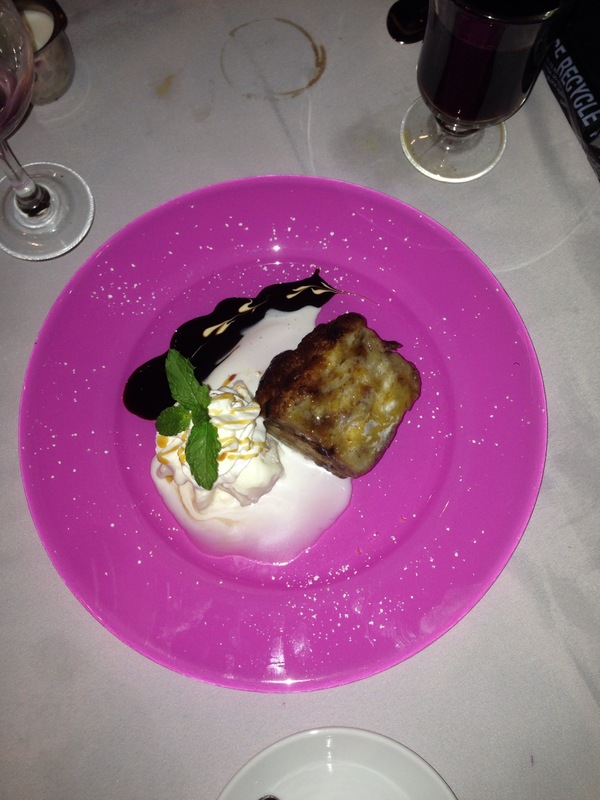 But we went with the chocolate banana bread pudding. It was, again, a solid good. Not too sweet and not too heavy, but also not out of this world great. 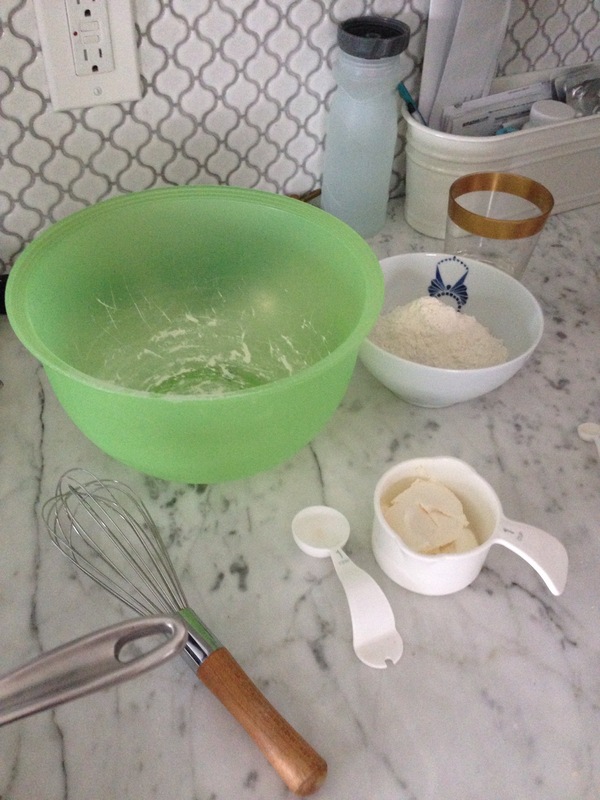 « Black bean brownies… ?